Our ChokeFree™ Shoulder Collar is a stylish, Step-N-Wrap TM designed, easy to wear, pet-friendly alternative to conventional neck collars and harnesses that are difficult to install. ChokeFree™ is for all pets and makes walking a delightful experience for both owners and pets. ChokeFree™ is for all types of pets and will provide excellent control without contacting the pet's neck or pressing on the pet's airway. ChokeFree™ harnesses are CUSTOM MADE for your pet. Therefore, they must be sized appropriately. CUSTOM MADE orders can take up to 2-6 weeks after receipt of your order to be delivered. ChokeFree™ makes it possible to walk a pet without causing pressure on the pet’s neck. The pet will not choke, gag, or cough while being restrained. With YOUR PET STANDING, wrap a measuring tape around the pet’s chest from behind the front legs up and around forming a circle to the top of spine. (If you are measuring from an existing ChokeFree™ Collars, you should lay the harness flat; take a measuring tape and measure from the center of the “D-Ring” to the middle of the slit in the Velcro. This will give you the exact measurement. )Measurements taken behind the pet's front legs should allow for a comfortable fit and not be tight. If your dog measures 10 inches around, order the size 10. If the dog measures 10-1/2 order the size 11. If your dog measures 25-1/2 inches order the size 26. It should be noted that ChokeFree™ is made out of leather and due to the natural characteristics of the leather, ChokeFree™ will soften and become more flexible and conform to the pet's shape. It is important for ChokeFree™ harness not to be too large once it has been worn and softened. The shoulder collar should be fitted such that the pet does not have enough room to pull out of the collar. If you have any questions, we always here to answer them by phone or email. My dog is very energetic and pulls badly on the leash. Unfortunately, he still chokes when he pulls hard in this harness but it is much less than in any other harness I bought. He has collapsing trachea and his chest is very sensitive. So as I said, this harness is better than any other I found so far. Thank you. This is the best, and healthiest for you and the dog. I love it, and would refer anyone looking for a harness, to this collar. 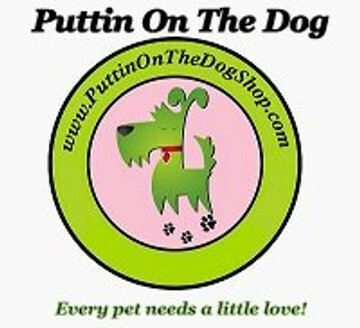 Also Puttin-On-The Dog is an awesome shop, and the owner is very helpful. I feel that that my 3 girls are snug and secure when wearing this Harness. Plus they look stylish.Whenever we are out and about people stop us to ask where we got them from. I love these harnesses this is the 3rd one I’ve bought and will continue to purchase different colors for my dog. Being from Tennessee I wish you had one in orange.